Samsung Electronics Thursday launched the Galaxy S III, which comes with a quad-core processor, a bigger screen and a host of software features, including voice recognition, the company said at an event in London. After months of speculation about screen sizes, camera resolutions and design, the smartphone is finally here. The 3G version will be available from the end of the month in Europe before being rolled out to 144 countries total. The LTE version will be out during the summer. The hardware specification is close to other high-end Android-based smartphones launched this year, including the already available HTC One X. The Galaxy S III is powered by Samsung's quad-core 1.4GHz processor, which is based on the the ARM Cortex A9. It has a 4.8-inch super AMOLED screen with a resolution of 1280-by-720 pixels, which is housed in a shell that is 8.6 millimeters thick and weighs 133 grams. "The display is really impressive," said Malik Saadi, principal analyst at Informa Telecoms & Media. Storage capacity is either 16, 32 or 64GB which can be expanded via the MicroSD card slot. There is 1GB of RAM, an 8-megapixel camera and NFC, as well. Samsung has been a proponent of NFC, so support for the technology isn't a surprise. But the memory size and camera resolution were rumored to be 2GB and 12-megapixel. One advantage over HTC's One X is that the LTE-version of the Galaxy S III, which will initially be released in the U.S., South Korea and Japan, will have the quad-core processor. The LTE version of the One X has a dual-core processor, while the 3G version has a quad-core processor. Samsung will also release a version with HSPA+ at 21M bps (bits per second). To help all that run as long as possible, there is a 2100mAh battery. "Battery life is going to be an issue. But I have been impressed with the battery life on the One X, so to me that says quad-core processors don't come with a massive battery problem, and the size of the battery in the Galaxy S III will also help" said Ben Wood, director of research at CCS Insight. As hardware specs have become more similar, vendors in the Android camp have been trying to differentiate their products using software, and the Galaxy S III is no different. Like its predecessors, it uses TouchWiz on top of Android. Samsung has also added integrated voice recognition. The feature is called S Voice and can be used to control the phone and like Apple's Siri ask for things like weather information. It will understand English, French, German, Italian, Spanish and Korean. NFC can be used to share content such as video clips, but the feature only works between two Galaxy S IIIs. "It is an issue when great functionality is restricted to specific devices. But the implementation on the Galaxy S III is a first step," said Saadi. Also, a number of features take advantage of the cameras and sensors in new ways. For example, the front camera can spot that someone is looking at the screen and as long as that is the case it won't dim the screen. Using face recognition the phone can link a person on a new photo to information in the address book, as long as there is a photo there as well. "Applications are starting to talk to each other to make the user experience better," said Saadi. The Galaxy S III also inherits a number of features from the Galaxy Note, including Facebook and Twitter accounts updated in real-time on the home screen, which has helped make the Galaxy Note a success, according to Saadi. "Samsung has added some clever bells and whistles on to the phone like S Voice and image recognition, but without using the phone its difficult to say how well it works," said Wood. But luring users with software isn't always easy. Many of the new software features are a boon for advanced users who are enthusiastic about technology, according to Saadi. However, getting the message across to a typical user is really hard, he said. The Galaxy S smartphones have been criticized for a design that is not luxurious enough. The new Galaxy is also made of plastic, but that is an improvement over the previous models, according to both Wood and Saadi. There are other considerations when designing a phone -- for instance, a metal case becomes a challenge when combined with NFC, said Wood. Still, the overall design is a bit disappointing, according to Francisco Jeronimo, research manager at IDC. "I think Samsung needs to be a bit bolder with the design of its phones to challenge the iPhone in that area, as well," said Jeronimo. Following the success of the Galaxy S II, there is a lot of pressure on Samsung to put out a great phone. "I think [the Galaxy S III] is going to be a massive hit for Samsung, but it isn't as disruptive as previous devices have been because the bar is set very high now," said Wood. Even though the Galaxy S III has a specification similar to other new high-end Android-based smartphones, Samsung's brand and marketing might will help reinforce its strong position in the smartphone market, according to Wood. Samsung now has the opportunity to grab market share while many of its rivals are struggling. "It is clear that this is the perfect moment for Samsung to do that, coupled with the fact that it has a four- to five-month lead over Apple's iPhone 5," said Wood. HTC, Nokia and Research In Motion all lost market share during the first quarter, while Apple's and Samsung's chunks of the market grew, according to IDC. But in the end, how competitive the phone truly is won't be clear until the next iPhone is launched, said Wood. After all of the rumors and speculation, the Samsung Galaxy S III is finally here but you probably have a few questions about this new Android phone. Samsung is the master of flash and flare at its press conferences, but we’re here to help you get to the nitty gritty of why you should care about this phone. The Galaxy S III will go on sale in Europe on May 23. No official word yet on a U.S. launch, but it could come this summer. Can the S III Really Follow Your Every Move? The Samsung S III really wants to be your new best friend--your new psychic best friend. According to Samsung’s somewhat creepy commercial (shown below), the S III “follows your every move.” Scared yet? Samsung Thursday unveiled the Galaxy S III, the highly-anticipated successor of the popular Galaxy S II, and of course, the iPhone’s newest big rival. The Galaxy S III is like a sequel to the Galaxy Nexus that was made in collaboration with Google, but has a bigger screen, a beefier processor, and a better camera. There’s no word on availability in the U.S. besides an expected summer launch, or any details on pricing and carriers. 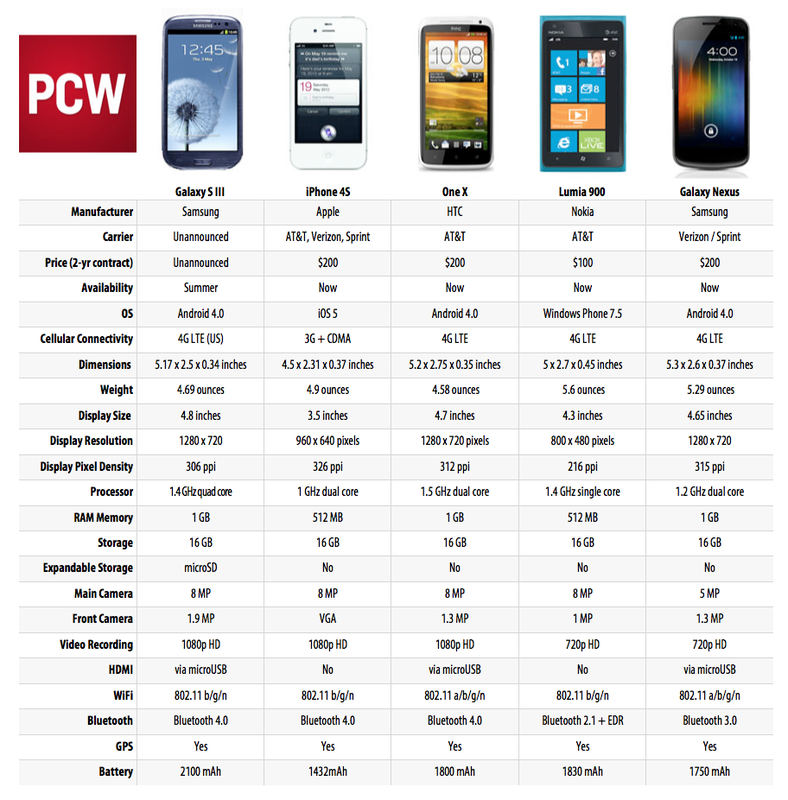 But since we know the specs, here’s how the Galaxy S III stacks up against the competition. The display of the Samsung Galaxy S III is huge. It’s 4.8 inches in diagonal, bigger than the HTC One X’s 4.7 inches or the Galaxy Nexus’ 4.65 inches. But while the screen is bigger, the resolution has not gone up: It’s still 1280 pixels by 720 pixels, as with the One X and Galaxy Nexus, making the S III pixel density 306 pixels per inch (ppi), which is still below the iPhone 4S’ 326 ppi for its 3.5-inch screen--which is the leading pixel density in this comparison. It has killer hardware. As expected, the Galaxy S III comes complete with a 1.4GHz quad-core processor that is top-of-the-line for smartphone hardware. Other key hardware features include an 8MP rear-facing camera, a 1.9MP front-facing camera, a 4.8-inch Super AMOLED display screen with a resolution of 1,280x720 pixels, and a 2,100mAh battery. And for good measure, the phone's design is both light and thin, as it weighs 133 grams and is just 8.6 millimeters thick. In all, the new Galaxy's hardware is about as cutting-edge as you can get right now.